A young boy quits the scouts to run off with his true love, Wes Anderson style. It would be remiss of me to talk about this film and not mention the cinematography, and while we expect something quirky, this really is a truly artistic endeavour. “Rule of the thirds is favoured by bang central composition”. Bang central indeed. It is so mesmerising in such a beautiful way. Tableaux vivants all the way. And it brings with it the Anderson quirk of characters (spread it with credit-Thanks Daniel Kitson). 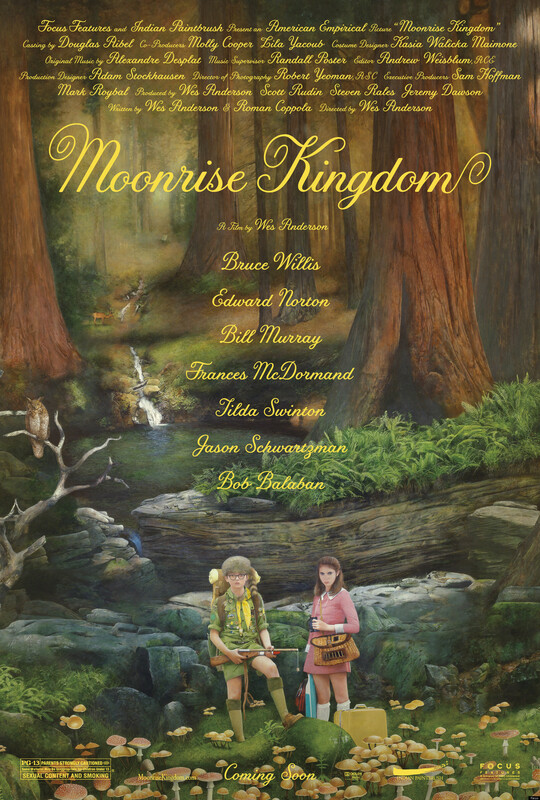 Bill Murray, Edward Norton, Bruce Willis, Frances McDormand, Bob Balaban and a few of nice surprises, but these actors play support to the main two kids in love. Jared Gillman as Sam and Kara Hayward as Suzy bring the right kind of odd to this world and because the tone is as Anderson as it gets it works beautifully. Rarely do we see love stories about children, for obvious reasons, but the tone and handling of this one is pitch perfect. There are times when I have felt there is a little style over substance with Wes Anderson, he’s clearly passionate about his worlds but there are times when I feel that it’s not connecting with me emotionally (The Life Aquatic). Maybe, that’s the point. If I went back and rewatched TLA, would I feel differently? Not here though, the charm and warmth is evident all over this film, from the soundtrack to the script, from the actors to the artwork on Suzy’s books, it’s here in spades. If you haven’t seen it and you are a fan of the big quirk, check it, if however, you can’t see past the paint strokes and the ARTifice, keep walking.